Please be advised of planned changes to our After Hours Service. Our agency is one of eight Children’s Aid Societies/Child and Family Service agencies in Ontario participating in a six-month pilot to have our calls answered by a Shared Service After Hours Team at the Children’s Aid Society of Toronto (CAST). The goal of the change is to create consistency, efficiency and to improve service and safety to children and youth. You will still be able to call the same number (905.333.4441 / 1.866.607.KIDS) to make your reports after hours for the Halton Children’s Aid Society. The call will be answered directly by a CAST After Hours worker, who will record the information and send it along to our agency for follow up. For situations that require immediate attention, our agency will still have after-hours staff and after-hours supervisors on-call and available for follow up whether that be by phone or in person. This change will impact anyone calling our agency outside of regular business hours. Our Burlington office is open to the public Monday to Thursday from 8:30 am to 7:30 pm and Friday from 8:30 am to 4:30 pm. Our Milton office is open Monday to Friday from 8:30 am to 4:30 pm. After Hours service remains active Monday to Thursday from 4:30 pm to 9:00 am and Friday at 4:30 pm to Monday at 9:00 am. To achieve these benefits the Halton Children’s Aid Society will transition to the After Hours shared service on April 15, 2019. National Volunteer Week, which takes place April 7-13, 2019, is a time to recognize, thank and celebrate Canada’s 12.7 million volunteers. The Halton Children’s Aid Society (Society) encourages you to join us in taking the time to thank the many volunteers who do so much in our communities. At the Society, our volunteers annually contribute more than 15,000 hours of their time in various roles including mentors, volunteer drivers, summer camp support, food for life program assistance, tutoring and so much more. Meet Jim. Every week, Jim packs fresh food boxes and delivers them to individuals and families in need. Some are young adults starting out on their own, others are single parents who need a helping hand – all appreciate his efforts. “I can’t imagine not being involved. I honestly don’t know what I would do without Children’s Aid,” Jim shares. There are many more stories from the hundreds of people who have volunteered with us over the past 105 years. During National Volunteer Week, we thank our volunteers, both past and present, for their wonderful contributions to the work of our Society. We are proud to recognize them this week and in the future. We could not do the work we do without them! Good neighbourhoods can help children thrive. Research tells us that in neighbourhoods where people get along, share values, and trust each other, youth have better mental health. And we know that neighbourhoods with lower social support and higher levels of poverty can negatively impact children’s development. It is because neighbourhoods can play such a key role in supporting positive development of children, that Our Kids Network (OKN) collects and shares data on child and youth outcomes at the neighbourhood level. Our brand new Neighbourhood Profiles showcase data from six different sources: the Early Development Instrument, Education Quality and Accountability Office, IntelliHealth Ontario, Kindergarten Parent Survey, Statistics Canada Census, and Tell Them From Me Elementary School Survey. Together, this data provides a snapshot of how Halton children 0 to 12 years-old are doing at the neighbourhood level. The Profiles provide Halton-specific information, enabling professionals and agencies to identify areas of vulnerability and strength in this population of children. The neighbourhood data can reveal gaps in services, help to identify changes needed, and support the implementation of those changes, all at the local level. The OKN Neighbourhood Profiles are complemented by municipal-level data from the Tell Them From Me Secondary School Survey, which provides information on the wellbeing of secondary school students in grades 9 to 12 in Burlington, Halton Hills, Milton and Oakville. Data becomes more meaningful when it is shared, debated and discussed. Use the OKN Neighbourhood Profiles and municipal data to create opportunities for discussion and collaboration with your colleagues and the community, and to better understand and respond to the needs of children and youth in Halton. What is an Our Kids Network Neighbourhood? Our Kids Network partners, researchers, and community professionals identified 27 different neighbourhoods for the purpose of collecting, analyzing and sharing important local research. The neighbourhoods’ borders reflect Statistics Canada census boundaries, and natural, transportation, municipal, regional boundaries. Posted in | Comments Off on Neighbourhoods Can Help Kids Thrive! The demand for measures that help keep vulnerable local residents off the streets is climbing. According to the latest statistics put forth by Halton Region, 1,925 households were supported last year by the municipality’s homelessness prevention services — an increase from 1,746 in 2017. The local families were assisted via dollars from the region’s Housing Stability Fund, which is used to prevent evictions and utility disconnections, secure permanent housing and furniture, and assist with moving and storage costs. The influx can be attributed to the region’s efforts to intervene earlier in the lives of Halton residents at risk of homelessness, supporting them to ensure they remain housed, explained commissioner of social and community services Alex Sarchuk. “The emphasis has shifted from emergency shelter to those upstream interventions,” he said during Wednesday’s regional council meeting. Sarchuk noted this shift in attention is largely responsible for a decline in family shelter admissions, which has fallen 36 per cent since 2015. He went on to present council with a snapshot of homelessness in Halton that reveals individuals and families continue to struggle to keep a roof over their heads in one of the Greater Toronto Area’s most affluent regions. An enumeration conducted last year revealed that 271 people were experiencing homelessness in Halton, up slightly from the last count done in 2016 that identified 264 individuals. Sarchuk said the increase is largely the result of a change in the way statistics are gathered, with the provincial and federal governments now mandating the inclusion of homeless individuals in hospitals, jails, motels and couch surfers. Of the 271 people considered homeless locally, the majority were staying in transitional housing or shelters, while the remainder were said to be couch surfing or staying in a motel, the hospital or jail. Fourteen individuals were experiencing unsheltered homelessness — a decrease of five per cent since the 2016 count was completed. One Vision One Voice (OVOV) is very pleased to share that Judie Powell and Sheehira Scott (Community Engagement Workers) will be leading provincial training for COMMUNITY organizations serving Black families. 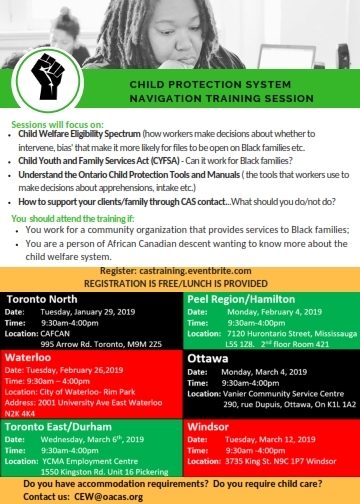 The training will focus on building capacity at community organizations to support Black families by giving community organizations relevant knowledge about exactly how Children’s Aid Societies (CASs) work, what they need to tell their clients and the best way to support their clients who are engaging with CAS. Training dates, particularly for Toronto, are on a first come first serve basis and are filling up. Between 1965 and 1984, thousands of Indigenous children were removed from their homes and placed with non-Indigenous families. Those affected lost all contact with their children and families. They also lost critical connection to their language, culture and identity. A class action lawsuit was launched with the intent to compensate those affected by this period. The Federal Government of Canada and certain survivors of the Sixties Scoop have reached a settlement of class action lawsuits that provides compensation for certain survivors of the Sixties Scoop. If you were a service recipient during this period, you may be eligible for compensation. The Child Welfare sector is actively working with local Indigenous communities and organizations to reconcile with the affected First Nations, Inuit and Métis (FNIM) families and individuals. Are You Driven to Volunteer? Do you have a few hours a week to spare, enjoy driving and are good with children and youth? This may be the volunteer role for you! The Halton Children’s Aid Society is seeking applications for mature and responsible volunteer drivers to transport children, youth and families to appointments and schools throughout the Halton Region. Volunteer drivers are mostly required during the day, but also evenings and weekends. Some drivers do specific weekly drives (one or two), others drive on a daily basis and some just once a month. Volunteer drivers play a valuable role in the lives of our children, youth and families. They become the familiar and friendly faces our clients can depend on. Posted in | Comments Off on Are You Driven to Volunteer? 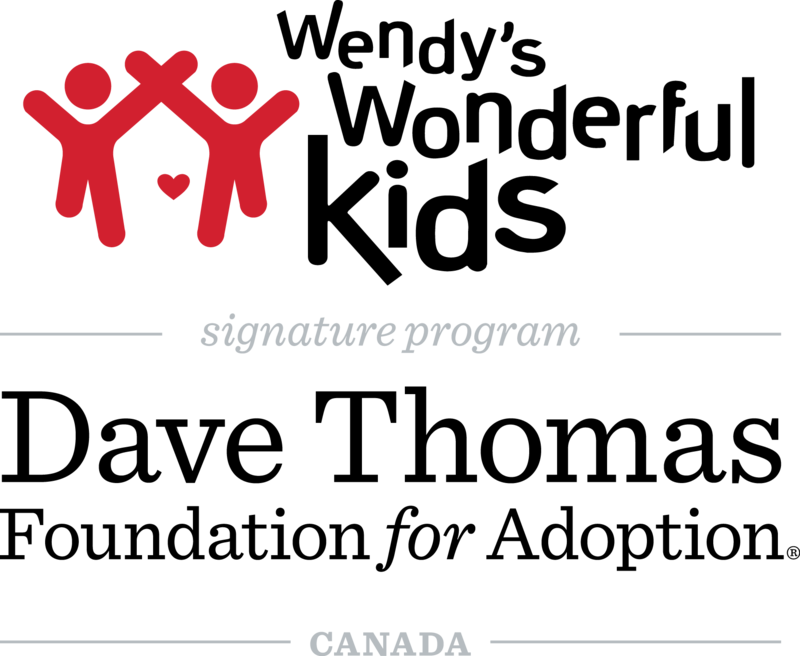 Foundation for Adoption (Foundation) that will bring children and youth waiting to be adopted from foster care one step closer to safe, loving and permanent homes. Through Wendy’s Wonderful Kids, the Foundation provides grants to adoption agencies and children’s aid societies to hire and train adoption recruiters who implement the Foundation’s Child-Focused Recruitment Model. This model is up to three times more effective at serving children and youth who have been in foster care the longest including older youth, sibling groups and children/youth with special needs. forever homes for children and youth in Ontario. 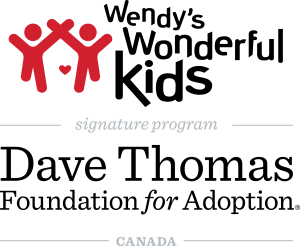 To learn more about the Dave Thomas Foundation for Adoption-Canada, contact Angela Marshall at angela_marshall@davethomasfoundation.org, subscribe to the Foundation’s newsletter and follow on Facebook and Twitter.